I was recently contacted by Australian brand Trefiel to see if I would like to do some nail art inspired by their hydromasks. Intrigued, I jumped over to their website to read about their product. What I discovered was they offer a plant based face mask designed to be moisturizing, nourishing and anti-aging. Anti-aging, hello, this chicky is going to be 42 in December and I need all the anti-aging help I can get. 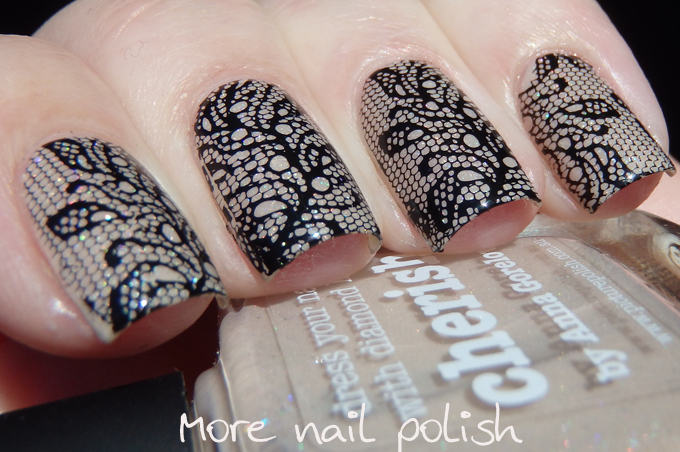 Plus, the masks are a very chic black lace, and who doesn't love black lace nails! So the collaboration was on. My package arrived super fast and I was very excited to try out the mask, which I did yesterday on a lazy Saturday afternoon. Now I'm a face mask virgin, so I had no idea what to expect. The texture of the mask is really cool (both in the fun sense and the temperature sense), you can't feel the lace at all, all you feel is a thin gel layer that is super smooth and cold. It was really refreshing and relaxing. You may have noticed that I don't show my face around here often - not that I'm some hideous monster or anything, it's just that my blog is about nails and nail art, not really the whole beauty thing. In fact I think I'm a bit too old to be considered a Beauty Blogger! I'm certainly not going to plaster my saggy wrinkly eyes over my blog, although I might post an Instagram story with my full mask on. A single package contains both an upper and a lower face mask. You can position them and overlap them however you need to get full coverage. I would definitely recommend lying down whilst wearing them, otherwise they do tend to slide down off your face. It is definitely a good excuse to have a quite moment to yourself (or not, if you are like me and have your kids coming around and poking at your face saying it feels slimy and you look funny). Let's look at my matching lacy nails. My base is Picture Polish Cherish and I stamped with Mundo de Unas black polish. the stamping place was Messy Mansion MM44, and I used a lace image that I hadn't used yet. I think this stamp really matches the lace in the mask quite well, right down to the round circles. Here I am, outside scoring some vitamin D on yesterday's glorious late winter's day with my anti-aging lace mask on. Canberra winter's really are the best. Ok we get cold mornings, but we also get so much sun shine. So what did I think, did I look any younger and were my wrinkles reduced? I can't say that I noticed much significant difference in appearance after one application, but I can say that my skin felt different. Much smoother and more hydrated. After applying the mask, I also rubbed the excess liquidy goodness that was dripping off it, into my hands, fingers and cuticles. They too felt a bit softer and more hydrated. Man how I would love a lacy pair of hydro gloves to wear to make my hands more moisturized and less wrinkly too - what do you reckon Trefiel?? Hydromask provided for nail art inspired collaboration.